Abram Games was born in Whitechapel in the East End of London on the day that World War I began in 1914. He belonged to the golden age of British graphic design when the commercial artist produced hand crafted concepts in the days before corporate design agencies devoured the individuality of the graphic designer. As a freelance commercial artist he produced posters for an astonishing list of clients that included Shell, London Transport, BEA, BOAC, Guinness, The Royal Shakespeare Company, London Zoo, The Metropolitan Police, The Times and The Financial Times. 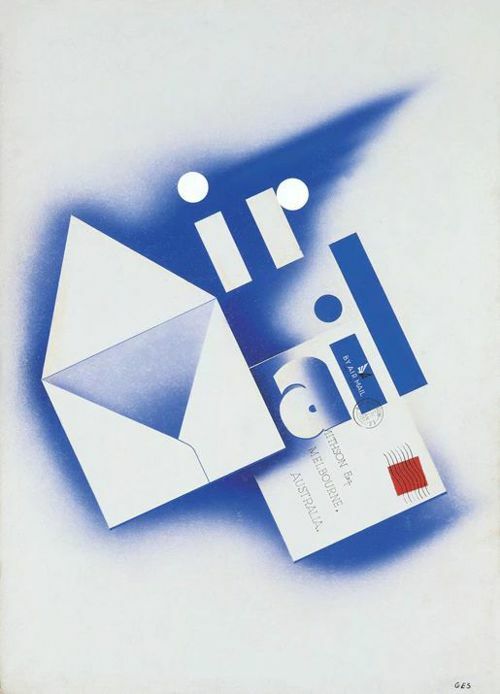 Abram Games 'Air Mail' poster of 1935 incorporates the main elements of his design philosophy: a perceptive combination of image and text that communicates a concept with ‘maximum meaning' using 'minimum means’. In his search for a solution to this poster design, the discovery of the the letters 'A' and 'M', the initials of 'Air Mail', within the structure of the envelope is typical of Games' nimble wit. He cleverly extends this idea by incorporating the blue air mail sticker as the letter 'i' in 'Mail'. Then, when faced with the problem of balancing the light letters of the word 'Air' against the dark letters of 'Mail', he creates a tonal counterchange by using a drop shadow in the background. Not content to simply let the shadow do this job, he develops its shape to suggest a bird's wing, which in turn echoes the 'wings' logo on the air mail sticker. Finally, he dynamically tilts the entire design to emphasise the idea of flight. The whole concept is conveyed by a stylish fusion of image and type, free from any unnecessary decoration. Abram Games' reputation as a graphic designer is based on his ability to weave together layers of ideas with a great economy of means. He realized that if you combine several images in one iconic design, the result involves the spectator in a visual game to unravel the layers of meaning within. Games explained, "A poster with a measure of intrigue engages the mind of the spectator and he looks again. You have to take him along with you so he follows your line of thought. The best way I can describe what happens is to say that as the designer you wind the spring, and it is released in the mind of the viewer." © Estate of Abram Games. During World War Two and for a while after, children were often attracted to the sites that had been used by soldiers for weapons practice. Tragically some were killed and many were injured in accidents when playing with 'blinds' - live ammunition that had been carelessly left behind after practice. 'This child found a blind' is a public information poster that tackles this sensitive subject. Games' poster cleverly addresses both halves of the target audience: those responsible (the military) and their potential victims (the public). As an image the poster is designed to communicate both on a conscious and on a subconscious level. Next, Games uses the basic shapes and colours of the images to communicate the message on a subconscious level. When seen from a distance, the combination of the shapes of the coffin/arrow with the grenade registers as a large exclamation mark - ! - a punctuation symbol designed to emphasise the message. Games choice of colours, red, yellow and black for both images and text are also designed to sound the alarm as they are natural warning colours. Red is a universal symbol of danger, while the combination of yellow and black, both in nature and design, indicates a potential hazard. Finally, Games uses a counterchange between the tones of the images and the graduated tones of their background to contrast and balance each component part of the poster. When you first look at an Abram Games poster it is deceptively simple, but every element is carefully calculated to communicate the message on a variety of levels to a wide target audience. Many of Abram Games' designs are visual puns with several layers of meaning. They were influenced by the metamorphosis of images and ideas that he saw in Surrealist art, particularly in the work of Salvador Dali. 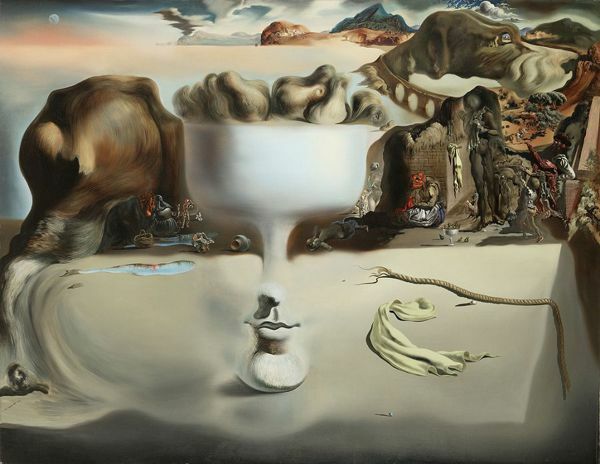 In 'Apparition of Face and Fruit Dish on a Beach', Dali creates a coherent image that conveys those fractures of time and place that we experience in the landscapes of our dreams: the landscape of sand and rocks become a table top with a bowl of fruit which is also a human face; the rocks in the foreground combine with the distant landscape to form a dog whose collar is the bridge that links them. Dali's images are designed to unlock our subconscious and free our imaginations. It is the clarity of their technique and coherence of their composition that make them acceptable to our senses. What Abram Games realized was that this approach could also be applied to his posters to increase their interaction with their audience. 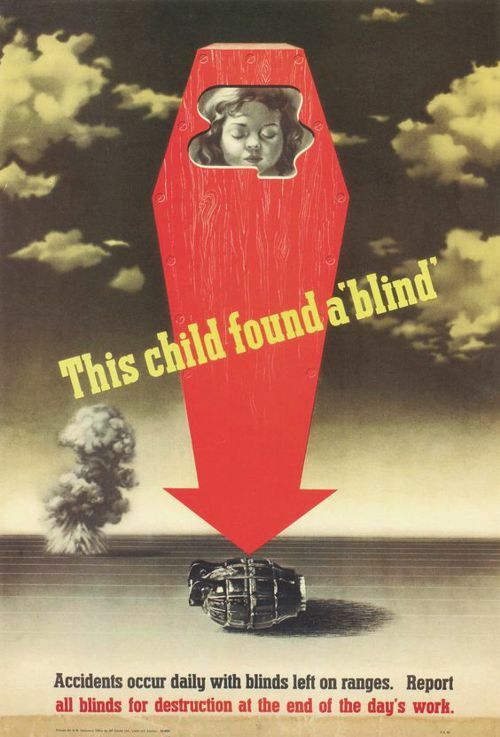 Games' poster 'Use Spades - Not Ships' perfectly illustrates how he adapts Surrealist techniques to maximise the communication of his message. In 1942, Abram Games became an Official War Artist producing public information and propaganda posters for the British War Office. His designs from this period have become iconic images that evoke the social history of their time. 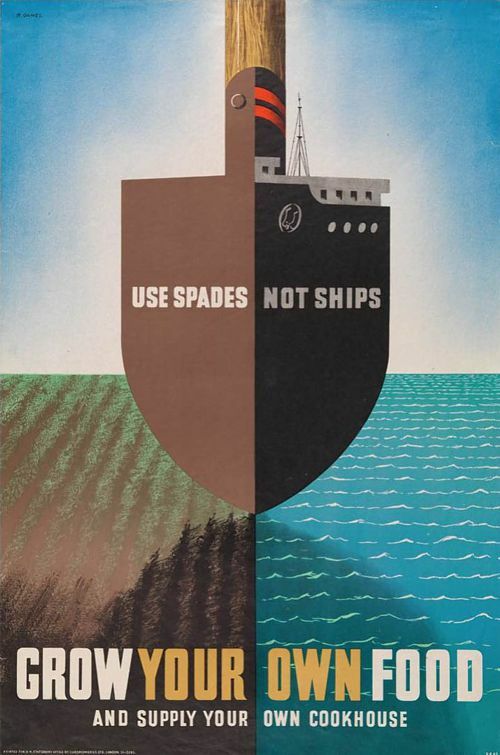 'Use Spades - Not Ships' was part of the 'Dig for Victory' campaign during World War 2. The poster was designed to encourage British soldiers to cultivate the land that surrounded their quarters. The aim of the campaign was to make the country as self sufficient as possible as merchant ships were being sunk with a great loss of life. At first Games struggled with the concept for the design as he tried to construct an idea around the side-on view of a ship. It was only when he realized that the poster was a portrait format and changed his viewpoint to a frontal view that he hit on the combination of the spade and the ship. The marriage of these two objects created an icon that met both sides of the message: the spade and land on one side, the ship and sea on the other. The idea was then developed across the horizontal and vertical axis of the poster forming visual links from side to side and top to bottom. The waves of the sea are cleverly balanced against the ploughed furrows of the land while the shadow of the ship at the bottom of the poster is echoed in the shape of the clouds at the top. The shadow also combines with the ship to create a figure of eight movement which is a compositional device that is designed to lead your eye around the poster. On a more subconscious level, the spade/ship icon doubles as an arrow that points to the message, 'GROW YOUR OWN FOOD'. Games breaks up this message with colour which performs two functions - to emphasise 'YOUR OWN' and to create a colour link with the spade handle thereby balancing the top and bottom of the design. The War Office started the ‘CARELESS TALK COSTS LIVES’ campaign aimed at servicemen on leave and the population at large. 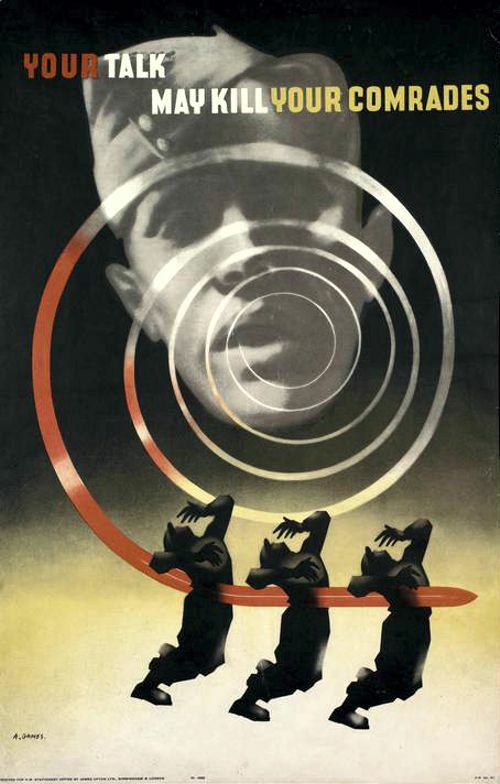 Abram Games' 'Talk May Kill' poster uses a variety of visual and psychological devices to create one of the most powerful images of the campaign. The idea was to dissuade soldiers from casually discussing their official activities as intelligence about the movement of troops could be gathered by spies with tragic consequences. A spiral which signifies circulating gossip travels from the mouth of a soldier symbolically changing its colour and shape into a blood-red bayonet, upon which three identical dying soldiers are impaled. The viewer makes the obvious connection. Again Games uses a tonal counterchange to balance both elements of the message: the gossiping soldier is light against a dark background while the dying soldiers are dark against the light. Not only does Games employ his red-yellow-black set of psychological warning colours but he also creates a symbolic colour link between the text and the action. The word ‘YOUR’ is the same colour of red as the bayonet, linking the blame for the tragic consequences to your actions. The words ‘YOUR COMRADES’ are the same yellow as the colour surrounding the soldiers. This not only reinforces your personal relationship with them but also suggests another alarming possibility - mustard gas - whose terrible effects still resonated in the memory of those who lived through World War 1. The words ‘TALK MAY KILL’ are colored white to separate what is the simple essence of the slogan. This phrase is also split to maximise its contrast with the background. The eyes of the soldier are deliberately shaded for two reasons: to prevent any distraction from the spiral of speech coming from his mouth; and to give him a general identity, so that he may represent all soldiers. The inclusion of the eyes would have given him a more individual identity with which fewer soldiers would identify. Games’ hand painted and airbrushed poster designs were the work of a gifted draughtsman with a creative talent for combining images and text to maximize the impact of their message. He once said of his work, “I wanted to create posters with forceful compact design, memorable and direct, with a minimum of lettering and text.... the message must be given quickly and vividly so that interest is subconsciously retained." Abram Games skills lie in his ability to educate and engage with the public on a range of different levels. 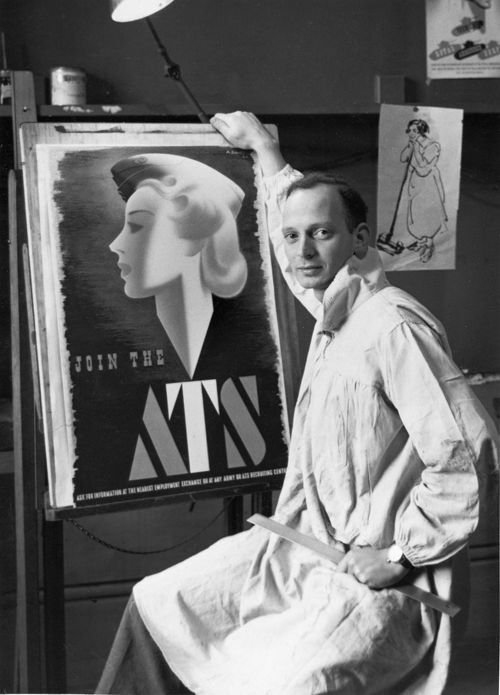 Designing posters for the War Office gave him the ideal opportunity to develop these skills free from the constraints of commercialism and enabled him to create a body of work which has become a fundamental influence on graphic design through its visual intelligence and economy of means. 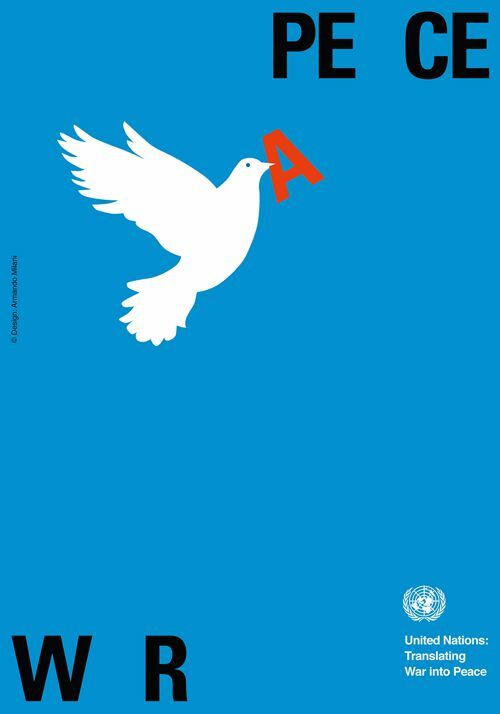 If we look at an example from one of the best modern graphic designers, Armando Milani's perceptive poster for 'Translating War into Peace', you can see that Abram Games' legacy of 'maximum meaning, minimum means' continues to inspire creative thought today. Abram Games was born on the day that World War 1 began in 1914. He was a freelance commercial artist - the title given to a self-employed artist who worked for the advertising industry in the days before the graphic designer evolved as part of a corporate design team. Numbered amongst his many clients were Shell, London Transport, BEA, BOAC, Guinness, The Royal Shakespeare Company, London Zoo, The Metropolitan Police, The Times and The Financial Times. Games was influenced by the images and ideas that he saw in Surrealist art. In Surrealism he recognized the potential for his images to work on a subconscious level. Many of Abram Games' designs are visual puns with several layers of meaning which communicate on a both a conscious and subconscious level. Games' designs have become iconic images that evoke the social history of their time. Games’ style is easily recognizable: simple, bold and colorful images that express his sharp intelligence and perceptive wit. Abram Games’ graphic designs were the work of a gifted draughtsman with a creative skill for editing images and text to maximize the impact of their message. Games summarized this approach as "maximum meaning, minimum means". Games philosophy of "maximum meaning, minimum means" is a forerunner of the modern design maxim, 'Less is More'. In order to appreciate good graphic design it is necessary to study the work of the best graphic designers from the past and present. UK: - Jonathan Barnbrook, Neville Brody, Alan Fletcher, Abram Games, Edward McKnight Kauffer, William Morris, Peter Saville, Si Scott, Storm Thorgerson. Japan: - Shigeo Fukuda, Yusaku Kamekura, Ikko Tanaka. 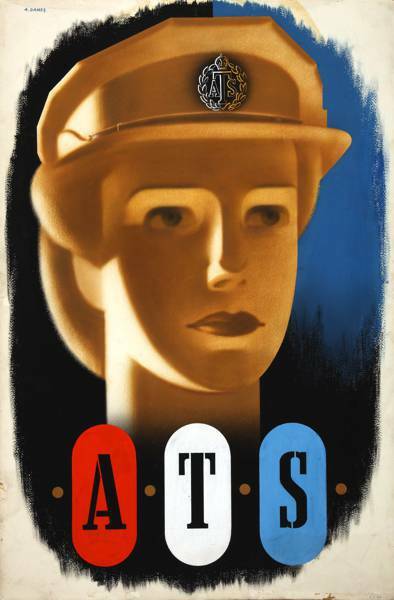 'ATS, Auxiliary Territorial Service Poster' (1943) by Abram Games.